This MaxExtract® deep cleaner is designed to clean a variety of surfaces from carpets to couches and sealed wood floors to tiled floors. MaxExtract® DualV® Nozzle Technology -we're pulling up a lot of dirty water so your floors dry fast and you'll be back to living on those deep-cleaned floors quickly. Pressurized Edge-to-Edge Cleaning - a wall of pressurized water that loosens and lifts stubborn stains with constant and relentless spray. 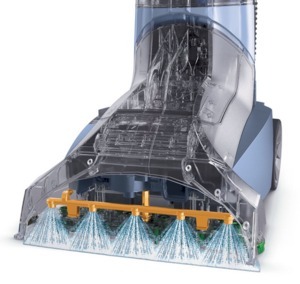 SpinScrub® 77 - counter-rotating brushes engineered to surround carpet fibers, removing dirt at every angle. It's like treating your carpet to a deep, massaging salon shampoo. 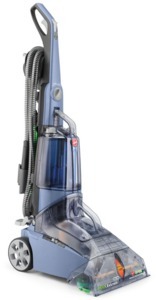 **Power Scrub Mode maximizes scrubbing action for cleaning carpet and high-traffic areas. 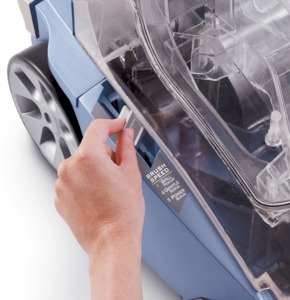 Heated Cleaning - powerful motor with forced heated air to help speed dry time. Auto Conversion Tools - conveniently positioned where they should be - right at your fingertips. AutoRinse™ - sets cleaner to wash with detergent on forward stroke, then automatically rinses with fresh water on the backwards stroke. CleanSurge™ - fingertip control applies extra detergent to stains and heavy traffic areas. SmartTanks™ System - separate tanks for clean and dirty water, so you can easily fill, empty and rinse each tank individually! MaxExtract® technology features the most advanced combination of multi-action agitation, carpet washing, dirt removal and direct heat drying - to provide the look of professionally groomed carpet that you can live on within hours of cleaning. With Dual scrubbing, multi-directional brushes have been specifically engineered to surround carpet fibers, removing dirt at every angle. A high velocity suction removes the dirty water from the carpet while applying forced heat to speed up dry time. Convenient, specially designed squeegee tool - for deep-cleaning those tricky hard-to-reach areas. Have peace of mind and peace of wallet with a complimentary 32 oz. 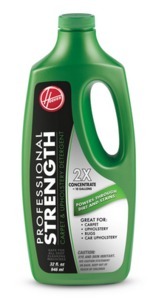 bottle of 2X Professional Strength Carpet & Upholstery Detergent - a powerful cleaner that's bundled with your purchase.